I gave the Anderson-Ericksons a quick sponge bath last night to get all those kitten crusties off. Not a lot of fun for the kittens, but they're looking (and smelling) a whole lot better. 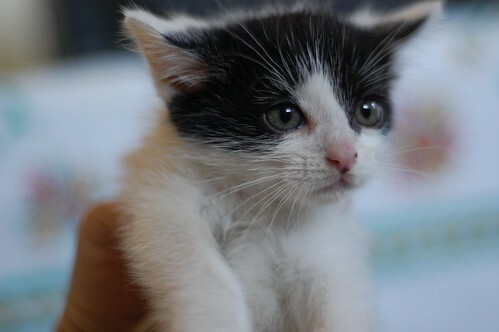 By the way, this little cow kitty (you got a sneak peek yesterday) is Mr Clement Anderson-Erickson. Please say hello, Clement. Nope. Not now? That's fine We understand. Well, hello, Clement "Mr. Crabtree" Anderson-Erickson. Welcome! Laurie, I think you better sleep with one eye open for the foreseeable future. Clement looks majorly ticked. He's obviously got his fur in a wrinkle over something...what a cutie pie!! Aw, nothing is so heartbreakingly cute as a crusty baby kitty. Could you BE more disgruntled, Clem? Relax little guy! You're in great hands and paws. Accck. Typeface too small. Can't read without getting really close to the monitor. Hello Clement and Emory. You're both adorable. Can't wait to meet your siblings! Clement, I love your little P.O.ed self. She did it for your own good and was probably a good bit gentler than the BEAN would have been judging from your "before" picture. Wow, he's even refusing to make eye contact. This little dude carries a grudge. Oh dear. Someone is *not* impressed. Mr. Clement, don't you feel better now that you're all clean? We'll wait for you. I'm sure you'll be smiling and purring in no time. Aww what a cutie even if he is a bit upset. It will get better Mr. Clem, you wait and see. You are in a kitten paradise now. My dear Clement, you have no idea how lucky you are, even if there was a bath involved. Ooh little grumpers, cheer up! Until yesterday, I had no idea people blogged about cats (other than Old Kitty and Charlie)! Seeing these lovely cat blogs warms my heart. I lost my cat to kidney failure two weeks ago tomorrow. Thank you for making me smile with these lovely photos. Hugs to you, Sharon....so sorry that you lost your cat. Many of us here have faced such sadness, some years ago, others more recently. Somehow following the kittens here helps with the heartache. You are among friends who understand here. Clement, you be a good boy now, and if you think *that* bath was hard to take, just wait til Auntie Charlene gets to you! Your life just got better. You have a warm bed, you're clean, you're well-fed, and you have a whole passel of fans who adore you! Just sayin. That brings back memories. Years ago my parents brought home dirty pair of farm kittens. We weren't sure about them until we gave them a bath. They fought at first but gave up and just let it happen. Mom gave my brother and I a kitten to towel off. She said I made a friend for life when I "rescued" my kitten from the bath. A good cleaning makes everyone feel better even if they don't realize it at first. I'm sorry about your loss Sharon and welcome to the IBKC. Sharon, You'll find this community is filled with people warm and compassionate people who understand what you're going through right now. The kitties help heal. They're magical that way. Young clement, please don't hold it against the world. You are going to be ecstatic with your home once you get a nice rest and Laurie care. You will also scent the foster momma extraordinaire, Miss Charlene Butterbean, in aboot 10 days - with luck! I love black and white kitties! I can't wait to see the rest of the herd! Hi everyone, first time posting here, just wanted to pass along an urgent request for help from a shelter in Berkley. Ah, Clement, your expression is so justified... the indignity of it all! (But you will feel better - we swear!) You and your brother Emory are just soooo handsome all cleaned up! Can we all say a big "Awwww.........."
Clement, you are most welcome to the fold, grumpiness and all. It's soo cute. That little face says it all! he was serioulsy NOT impressed with having a wash! MOL! "I didn't need no stinkin' baf". And Sharon, you came to the right place. Hope you will stay and start to feel better soon! Clement - are you a serious kitten or just really really tired? You look serious. Like you'd read Jame Joyce serious. Perhaps some time with Miss Bean will lighten your mood. clement is white-lipped with indignation! Clement looks like not only does he read James Joyce, he understands James Joyce! Clement, I think you should visit my Hawthorne cat -- her former vet put in her record that on her last visit there she was "a little grumpy," even without a sponge bath! I completely get the attraction to serious kittens, tho. I just ADORE this little grouchy face! One of my favorite pictures yet! Oh, sweetie! You don't look so much grumpy to me as you do dazed and confused. A little sad, too. Your ears aren't real perky, kinda like you're thinking, "Oh, man, what's next!?" What's next is what others have said - livin' the Life of Riley, with all the considerable love and nurturing of Laurie, Auntie Charlene and the rest of the IBKC. You'll be okay, sweetie. Just give it some time.